Norton Internet Security 2010 is comprehensive Internet security software that offers protection against viruses, online identity theft, hackers, bots, Trojans, rootkits, spyware and malware. In addition, the new Norton Internet Security 2010 also offers the fastest install time, the fastest boot time, the fastest scan speeds and the lowest memory requirements. 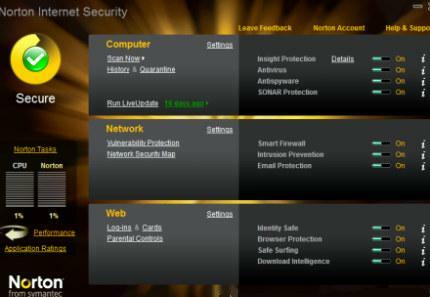 Moreover, Norton Internet Security has added tons of features such as Norton Threat Insight, Professional Strength AntiSpam, Norton File Insight, Norton IdentitySafe, Parental Controls, Norton IdentitySafe On-The-Go, Norton Insight Network, Norton Download Insight, and SONAR 2 (Symantec Online Network for Advanced Response) Behavioral Protection that uses real-time online intelligence and proactive monitoring to detect and stop new threats. 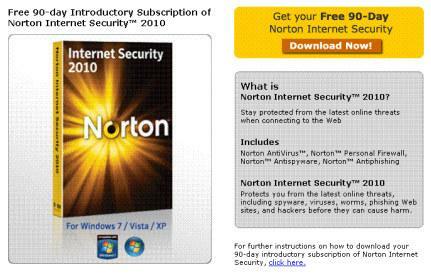 Norton Internet Security 2010 normally cost $69.99 to purchase. As part of promotional offer from Symantec, now everybody can get a free 90 days Norton Internet Security 2010 with full commercial working version, with no restriction nor locked features. Then click on “Download Now” button and choose either Run or Save. A pre-install scan appears. This scan can take a while. Note: If you think your computer is virus free, you can click “Skip Scan” to skip the scan. Once installation is completed, choose the ‘Agree’ to the License agreement. Click “Finish” button to complete the license key registration. Norton Internet Security 2010 supports Microsoft Windows XP, Windows Vista and Windows 7. Check out also more free antivirus deal.